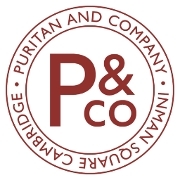 Puritan & Company serves modern American cuisine, with particular emphasis on traditional New England fare, and not without occasional excursions into other ethnic ingredients and styles. Our mainstays are ingredients sourced from farms we know and locally to the extent possible, and always a sense of fun. Our kitchen and management team has over 45 years of combined restaurant experience from primarily the New England region. The team brings a unique mix of culinary and beverage experience together to offer quality food, local beers, and wine from independent makers worldwide. Puritan & Company’s space is a casual and fun place to dine. We love to share our excitement about the food and wine we serve like any hosts at a dinner party. Guests and their friends should feel comfortable in our friendly and even familial environment as we make our food and guest the number one focus.